The Chapter starts exactly where the past left off…With Fuuka seeing Yuu embracing Koyuki in his arms. Quickly Yuu tries to explain to Fuuka that this isn´t what it looks like! –Everyone says this- but his words goes to deaf ears and Fuuka retires. Yuu tried to go for her; but suddenly “Tama-Chan” grabs Yuu´s clothes, she wants to keep having contact with her “Nico-Kun”. In that moment, the only sound was the drops of water that fell on the umbrella. Meanwhile with “Nico-Kun” and “Tama-Chan”, She finally lets Yuu go and ask her if that girl is the one to whom he is making a band? Yuu says that yes, she is. Koyuki then says that maybe this scene gave her a wrong idea… Since they are just friends, The tone in her voice left out some sadness by saying such words. The next day, Koyuki tries to explain to Fuuka about what happened with Koyuki; he tries to tell her that they are just friends and there is nothing happening between them. Then Fuuka ask him why he didn´t told her? Yuu says that he just didn´t found the time, which Fuuka says that is just a lot of bullcrap since he could have told her when they went to see the movie, or in the concert; but noooo! He just decided to say nothing!... Yuu has no answer for this. Fuuka leaves. For the rest of the day Yuu experiment Fuuka´s cold shoulder and the silent treatment, whenever their eyes meet she just shown an angry face; Fuuka, with anybody else, was her normal self; but with Yuu it was different, and he noticed all of that with the pass of the hours that felt like decades for him. In the evening, Yuu is thinking what to do, how can he explain himself with her? For her part, Fuuka was in the beach house and Mikasa ask her what happened between her and Yuu? She just says that they had a little fight; but nothing else. <<<Stranger?>>> says Fuuka with the voice of indignity. Yuu tries to keep explaining about trolls, spams and everything that it´s in Twitter right now and… and… Fuuka interrupts him and tells her that if he believes that she is the kind of person- no, a Stranger; who would go out of it´s way and be blabbing about this thing to everyone?! Yuu stops himself and Fuuka leaves angrily, She tells Yuu to now make fun of her! The next day, the relationship between Fuuka and Yuu hasn´t made any progress and both Mikasa and their boss notices it. In any case their teacher, Tomomi, Nachi (Their Senpai) and a random stranger has come to see them! A little later Nachi is trying to convince Fuuka to join the Track Team for once! Obviously Fuuka doesn´t want that and she even asks why Nachi is here? He explains that when he heard the news from Tomomi-Sensei he decided to tag along! In any case Nachi keeps trying to convince her; but his efforts are fruitless, Fuuka tells him to knock it off already! She is going to make music and her band will be as awesome as the Hedgehogs! Tomomi-Sensei´s reaction was a strange one, since she liked the good words of Fuuka towards the Hedgehogs; but why? Then Yuu looks at the random stranger… Is he the Hedgehogs Guitar Hisa?! Then Tomomi must be their… ahmm… Manager? Tomomi then tells them, somewhat angry, that she was the keyboardist! Also their boss was the drummer in the Hedgehogs. Needless to say, both Yuu and Fuuka can´t believe it! Fuuka asks her teacher why she didn´t told her?! She is a huge fan!! Tomomi says that she wanted it to be a surprise; in any case they are older now though. Yuu and Fuuka are fascinated to be in front of the members of one of their favorite bands ever! Still the moment Fuuka realizes that she is bonding with Yuu again, she gives him the cold shoulder… Again. In any case Fuuka asks why they are on hiatus, and where are Tama, their singer, and Nico, their bassist? The former Hedgehogs says that just one day Tama decided to go away, and Nico went in her search. And since that moment the Hedgehogs entered in Hiatus. Fuuka then asks Yahagi/Yassan to teach them music when they go back to Tokyo. Nachi interrupts and tells her that become a Pro in music is truly hard, she should aim for tracking instead where she in truth has some ability! Also there is no proof that she has talent for music! Fuuka doesn´t say a word; suddenly Yuu interrupts and says that Fuuka has talent, that her Singing is truly, truly good. Tomomi, who was already drunk, decides to make a test for Fuuka. The test is simple, she will sing! The Hedgehogs will be accompanying her; although for the Bass Yuu will be the one who will assist her, although he hasn´t even touched a bass before. Nachi-Senpai is glad with this test since he is sure that Fuuka will mess up and after that reality shock she will go with tracking all the way! In any case, Yahagi just tells him how to use the bass for this song… More or less. Suddenly Mikasa wants to tell Yuu something, they go to the restaurant and he asks him what is happening between him and Fuuka? Yuu confess to him that he would like to resolve things with her; just he doesn´t know how, since when Fuuka is angry at him, he just can´t enjoy anything, the work becomes dull, the food tastes bad, and the hours drags on too long; he just wants Fuuka to smile with him. That´s why he just wants to make up with her! Mikasa then reveals his secret, that he should have told her this earlier… Right Fuuka? Mikasa explains that Fuuka feels the same way as Yuu, just that she didin´t know how to apologize. Fuuka gets up, she heard everything. Mikasa then decides to leave them alone to talk. Yuu doesn´t know what to say since what he said was more or less like a confession of love! Fuuka just then gives him a slight punch and apologizes to him; Yuu for his part apologizes too, Fuuka also gives her thanks for taking her side earlier. Now the test is about to start, the song to play will be “Climber´s High” (AKA the Opening Song) from the Hedgehogs. The song starts and everyone is amazed by Fuuka´s talent at singing, she has presence and can reach the correct notes; her talent is so much that even Nachi-Senpai without noticing it is enjoying the music with his fingers, like if he was playing the drums. For Yuu, in his eyes, it was like Fuuka suddenly got angel wings. In the distance Koyuki´s team, and “Tama-Chan” herself hears the song and enjoy it. Koyuki is able to even recognize the song. When the song ended a crowd gathered and wanted more! 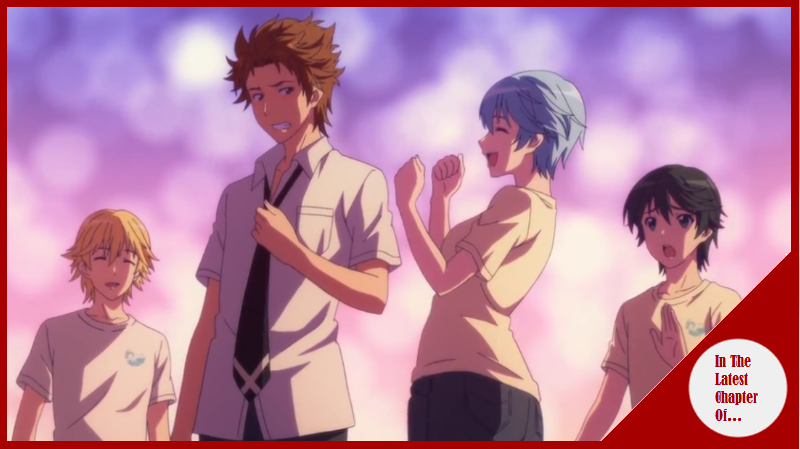 They where captivated by Fuuka´s singing! After that Fuuka got the approval of the pros and even Nachi can´t deny that Fuuka has talent, also he admits that he was like playing the drums because he knows how to play them since his big bro made him play them when he was in a band. With those words, Fuuka has recruited Nachi as the drummer in the band! Now they have a full band with Mikasa as the Keyboardist; Nachi as the drummer; Yuu as the bassist and Fuuka as both the guitar and vocals! Yahagi says that Fuuka indeed has talent, and Tomomi even says that one person can make a band fly higher, one extraordinary genius… And it seems that genius is Fuuka. In the night; Yuu sees Fuuka at the beach and he goes with her, she wanted to see the night sky at the beach one last time since they are going to come back to the city tomorrow. A cold breeze comes and Fuuka is freezing, then she decides tot ake half of Yuu´s jacket. The heart of Yuu is pounding like crazy, and it seems fuuka´s one too. … This happened. Needless to say a world of pain came to Yuu. The credits roll; but it´s not the end! “Tama-Chan” was in there, waiting for him. -Dejad que cante el Muchacho (Let the boy Sing) by Joan Manuel Serrat. A very Good chapter this week! Man I loved most of this chapter. The tension in the first part was very good, seeing how Fuuka, Yuu and Koyuki reactions was truly good, it made my heart hurt a little with all of that drama! The Music part was also incredibly good! From the changes in camera, the reactions of everyone and the song, which is the one of the opening, is indeed very catchy! It truly make us see that Fuuka has everything to become not only a Pro; but even reaches to the top in the musical industry! Still, my only negative with the chapter was how forced some of the “Teen Drama” was after the first minutes of the chapter (which were excellent); but after that the thing fell flat and while it made us clear to understand what is happening, the thing was just a forced misunderstanding that could have been resolved sooner and easier; at the same time I also feel that if they would have gone a little more with inner commentary and maybe a more gruesome background music, the Drama in this section could have been waaay better; but oh well, what´s done is done. Finally. Nachi-Sempai has joined in Fuuka´s crazy band, and his transition was somewhat good. So I have no objections!